We moved into our new home in December and entered a whirlwind of activity – Christmas, my grandma’s 90th birthday party, visitors galore. We brought in furniture, hung things on the walls where there were already nails, and stashed everything else in the basement until after the chaos had slowed to mere turmoil. 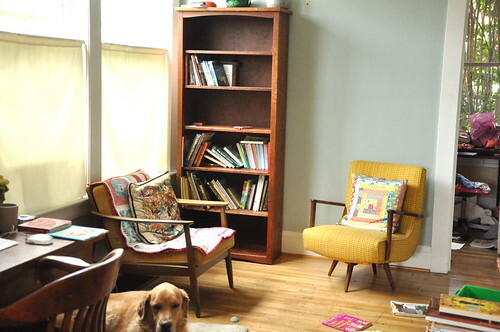 Oh, and in the process of painting, I sold our too big couch, and moved all of the furniture. Hence the lovely scene below. I knew that before anything else really happened, that painting the walls had to come first. This is an old home and the walls showed years of patching and repair, but clearly hadn’t been painted in quite some time. So, after a lot of trips to the paint store, many test quarts of paint in many colors, and a lot of “help” from the 3 year old, we have a newly painted dining room and living room. I wanted a peaceful and serene color in the living room that would provide a nice background to our art, vintage furniture, and colorful pillows and quilts. It’s a small room with large windows, a fireplace, and one wall mostly open to the dining room and kitchen, so we needed a color that was a real color, but would not take over visually. I started with a grey that I’ve used before and then tried a clear aqua. During the decision making, I received some crewel wool in the mail that included the perfect shade of greenish bluish grey. I rushed back to the paint store and matched it to a color chip. Perfect! My dining area is open to the kitchen and has a huge bay window, as well as a large built in china cabinet. We have 10 foot ceilings, and in this room there is wainscoting that goes halfway up the walls. 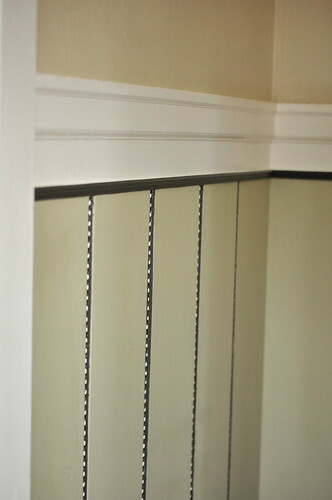 I decided to paint the lower half of the walls in the same white as the built-ins and trim. Well, really I was going to also repaint the built-ins and trim to match my wall white since I didn’t know the original color, but I accidentally matched my white perfectly to the existing white. Hello, timesaver! 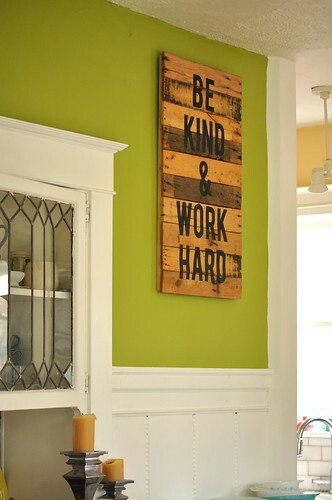 We decided to go with a bolder color in the dining room that would pop agains the white, and there’s nothing I love more than a bright apple green. Except maybe the green paired with aqua and white. There’s so little wall that I was able to get away with doing something really fun. This one we hit on the first try. For reference, this is how the room looked before. Yikes! Everything now feels so much lighter and brighter – just perfect for the new light of spring. 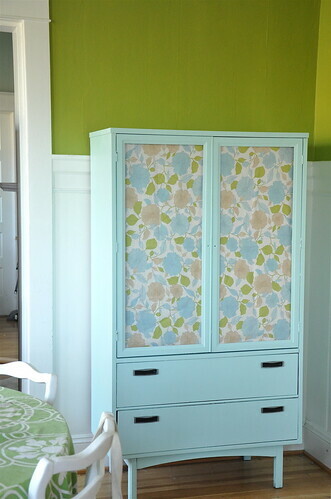 Oh, and that cabinet? We’ll talk about that in my next post. Because everything’s better with a little paint. looking beautiful — house & blog! You did a great job with those colors. Thanks! I really love them. Looks do beautiful, Sarah! I love it all! 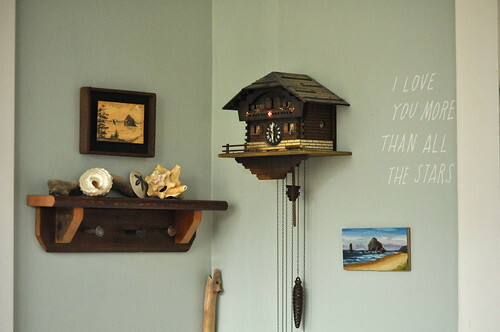 lovely paint colors, so glad to have found your new spot. Sarah, I just love your choice of paint colors! And the apple green aqua thing? I totally get it. I’ve been doing that myself in our family room lately. Adding little pops of red here and there, too.